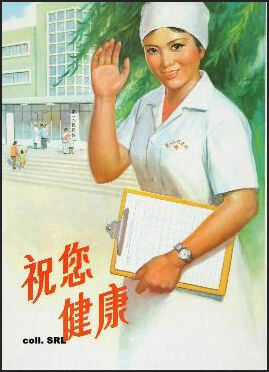 Hygeine poster Improved health care was considered one of the great success’s of the Mao era. Barefoot doctors brought modern medicine and prevention strategies to places that had minimal health care. 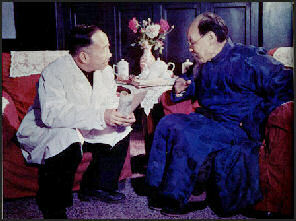 These and other Chinese health care workers are credited with 1) reducing infant mortality to a lower level than in New York City, 2) eradicating small pox and nearly eradicating sexually transmitted diseases, tuberculosis and schistosomiasis and 3) raising the average life span of Chinese from 35 in 1949 to 68 years in 1979. Many of China's health statistics are comparable with those of a much richer country. "Mao Zedong's great contribution in medicine was that he advocated developing the healthcare system in rural areas," Dr Michael Phillips, one of China's top psychiatrists, told the South China Morning Post. "With so-called barefoot doctors in villages, the public health level in China's rural regions was better than other countries at a similar stage of economic development. In the Mao era everyone was covered by health insurance that was free or very cheap. Although the medical care was often less than ideal at least people were covered and if they did need hospitalization it wouldn’t bankrupt them. The cost of having a baby delivered at commune hospital in the 1980s was about $3. The state subsidized treatment for all kinds of illnesses. One Chinese factory told Reuters, "I never spent a penny. Often you’d be given a week's supply of medicine when you only needed it for two days. The rest you'd just throw away." In the 1950s, Mao launched a campaign to get rid of the snails that cause schistosomiasis by urging peasants to turn over soil in lakes and river beds by hand before the rainy season. People chanted slogans like "our strength is boundless and our enthusiasm redder than fire" and were inspired by banners that read "Empty the rivers to wipe out the snails, resolutely fight the big bell disease." The campaign came very close to eradicating schistosomiasis. Mao launched the program to kill the "four pests" (sparrows, rats, insects and flies). Every person in China was issued a flyswatter and millions of flies were killed after Mao gave the directive "Away with all pests!" The fly problem persisted however. 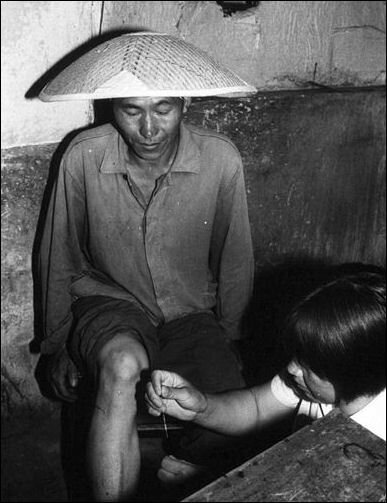 Doctors in the Mao era In the Mao era, around 1 million "barefoot doctors” were give six months of training and sent out to countryside to open rural clinics, provide immunizations and offer basic medical care. They often wore straw hats and carried small wooden medical boxes from their shoulder. The barefoot doctor tradition lives on in services such as the Lifeline Express, a train that operates in poor areas in Xinjiang Province and offers cataract surgery for free to all comers. The cataract operations take 15 to 20 minutes, involve cutting the cornea and replacing a clouded lens with a clear artificial one,. The operations given in an assembly line fashion to patients by doctors who put in 12 hour days and volunteer their services for little pay for one-year stints. Although China's “barefoot doctors” scheme relied on primitive supplies and under-trained doctors, it has been acknowledged by the World Health Organization (WHO) for the pioneering role it played in the development of China's rural primary healthcare. barefoot doctor doing acupuncture Describing the difficulty in bringing good medical care to rural areas in China, one barefoot doctor told the New York Times, "When we go out and try to inoculate babies, some peasants are very frightened and hide their kids. Or they turn their dogs on us to bite us and drive us away...We give them injections for measles, and then the kid gets a cold. So the parents come, and complain. They say, 'You promised that my child wouldn't get sick!'" The inoculations themselves are fairly easy to give to young children because many of them don’t wear pants or they wear pants purposely made with holes in them.. These days the doctors don’t roam so much any more. Each village has its own doctor. A typical rural clinic run by a barefoot doctor consists of a single room in mud-brick, thatch-roofed building or concrete, tin-roof structure with a couple of bamboo cots, a desk and wooden cupboard with some pain, fever, diarrhea, and cold medicines inside. It typically doesn’t have a phone but it does have disposable needles, an improvement from the old days when needles were reused after they were swabbed with alcohol. Rural clinics typically have dirt floors and lack sterilizing equipment, Many of the medicines are fake but are sold by doctors anyway because the drugs are their primary source of income. Equipment consists of a thermometer and a blood pressure machine that doesn’t work. Wish lists by barefoot doctors include a stomach pump, tools for extracting abscessed teeth, and oxygen cannisters for respiratory problems. With the introduction of economic reforms and capitalism, money for public health has declined. Barefoot doctors see fewer people because their patients have to pay considerably more than they did in the old days and people get sicker less. One barefoot doctor told AP, "Now the job is easier because vaccinations have eliminated so many diseases, like measles." One their most successful herbal medicines, pumpkin seeds, was used to rid victims of worms. Today the treatment is also used in Africa to combat schistosomiasis.